Due to the increasing demands of major OEMs to reduce inventory, improve lead times and reduce cost in the supply chain there is a need to investigate alternative methods of steel delivery. A major 1st Tier subcontractor to 3 of the world’s largest yellow goods OEMs purchased steel bar from mills, as this was traditionally the most cost-effective approach. This route had started to cause some issues in the supply chain more recently, as the OEMs had reduced the visibility of firm forecasts on parts required. This in turn made it difficult for the subcontractor to order the correct amount of material from the steel mill on an average 3-4-month lead time. If too much was ordered it created cash flow problems and storage issues; if not enough was ordered additional top-up material had to be ordered at increased cost per tonne and/or supplied as oversize material which added additional machining costs. Hillfoot have partnered with a major European steel mill to become a logistics partner to the subcontractor. Steel is now forward ordered from the mill, which produces an agreed quantity per size/grade. Material is held at the mill, with an agreed amount also held at Hillfoot, which can be called off as required. This allows next day delivery of material and for exact quantities of each size/grade to be delivered, rather than minimum order quantities of all sizes being delivered direct by the mill as happened under the previous arrangement. This solution not only allows ‘Just in Time’ delivery but also improves customer cash flow, which in turn can increase efficiencies in the supply chain. The model can be replicated in most supply chains where material is purchased from mills in volume. 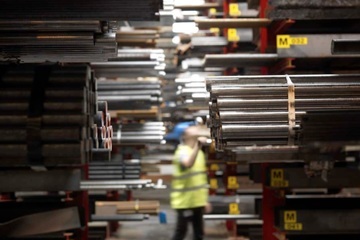 Contact Hillfoot to discuss how we could help to make your company’s steel supply chain more efficient. Ask our experts for price and availability details for your steel requirements. See our full selection of carbon and alloy steel grades.